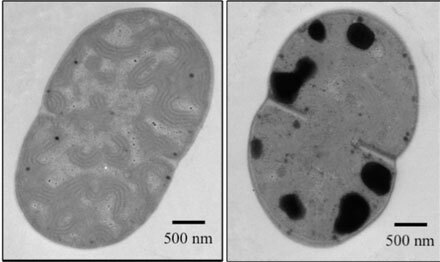 GROWING PROBLEM Before (left) and after (right) images of A. variabilis cells exposed to TiO₂ nanoparticles show the growth of cyanophycin grana protein granules (dark spots). Products coated in titanium dioxide nanoparticles (nTiO₂) shine pure white. So since the 1990s manufacturers have added the chemicals to a wide range of consumer products, such as cosmetics, paints, sunscreens, and even foods. Now nTiO₂ often discharges into open waterways through treated sewage effluent. A new study reports that this nanomaterial can stress photosynthetic organisms, which could lead to the disruption of nitrogen and carbon cycles in aquatic ecosystems (Environ. Sci. Technol., DOI: 10.1021/es101658p). Most research on the toxicity of nTiO₂ has focused on the chemical’s potential human health effects rather than on its environmental impact when it reaches rivers and lakes. So environmental engineers April Gu and Carla Cherchi of Northeastern University in Boston wanted to study how the nanomaterial affects a model organism from an aquatic ecosystem. The researchers picked Anabaena variabilis—a common cyanobacteria, sometimes called blue-green algae—because the bacteria undergoes photosynthesis and nitrogen fixation. “It represents a crucial step in both the nitrogen and carbon cycles,” Gu says. Gu and Cherchi grew cultures of the cyanobacteria with varying amounts of suspended nTiO₂. To evaluate the nanoparticles’ effects, the researchers monitored changes in cell growth and cell structures, such as production of cyanophycin grana protein (CGP) granules. Previous studies have shown that organisms synthesize this nitrogen-rich protein during environmental stress as a means to store nitrogen. At nTiO₂ levels similar to those found in wastewater effluent, A. variabilis growth dropped by 90%. The researchers also observed that CGP granule size increased with both greater nanoparticle concentration and exposure time. When exposed to high levels of nTiO₂, CGP granules occupied greater than 16% of the cell’s cross-sectional area within 96 hours, compared to less than 1% for controls. Both observations suggest nTiO₂ could disrupt an aquatic ecosystem’s carbon and nitrogen cycles, the researchers conclude. During times of slowed cell growth, photosynthesis grinds to a halt and the cell’s carbon dioxide intake drops. Meanwhile, synthesizing CGP granules shifts fixed nitrogen away from production of inorganic nitrogen compounds, which the bacteria normally excrete into the environment. By documenting the effects of nTiO₂ on aquatic ecosystems, the study fills an important data gap in nanomaterial toxicology, says Anne Kahru of the National Institute of Chemical Physics and Biophysics in Estonia. She also points out that nTiO₂ toxicity could have a potential application: Water purification processes based on nTiO₂ could limit growth of cyanobacteria in closed water systems, such as cooling towers and boilers.